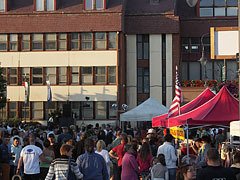 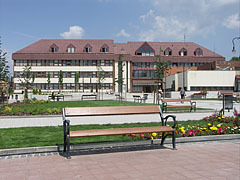 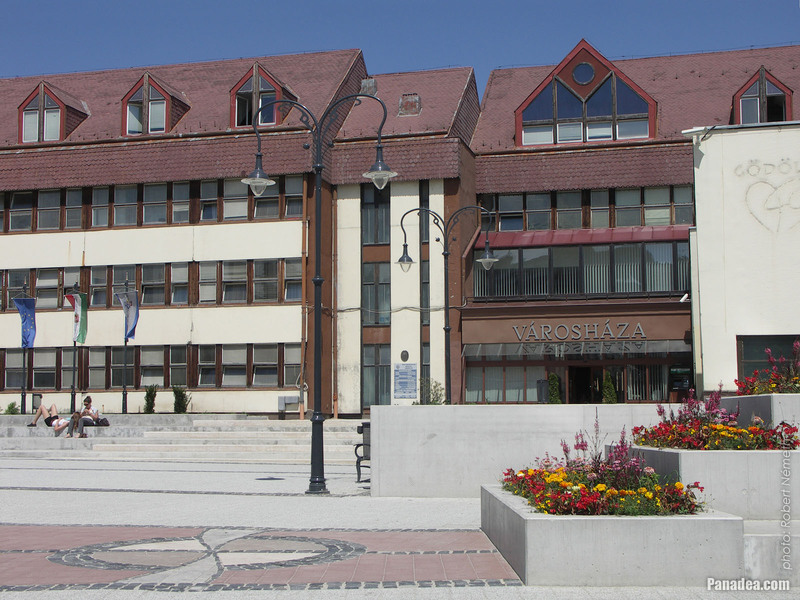 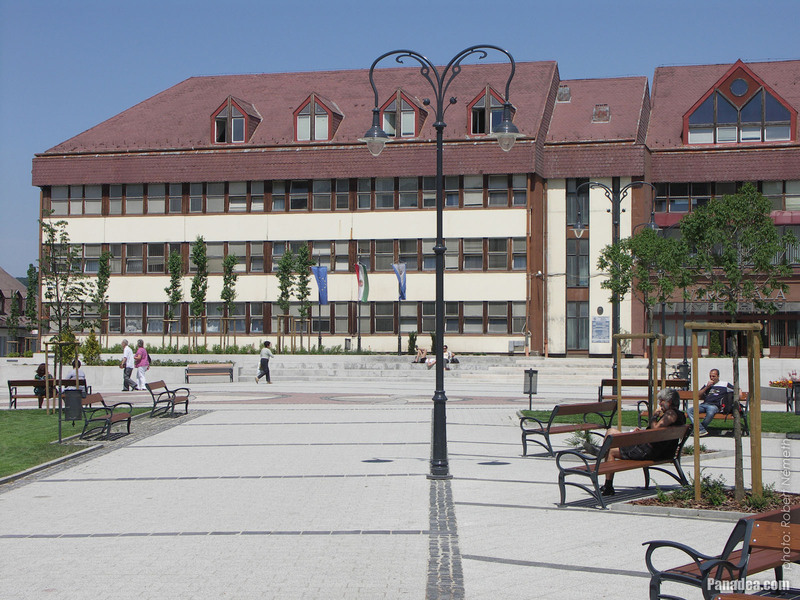 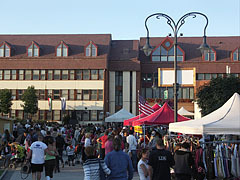 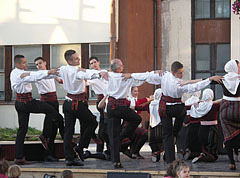 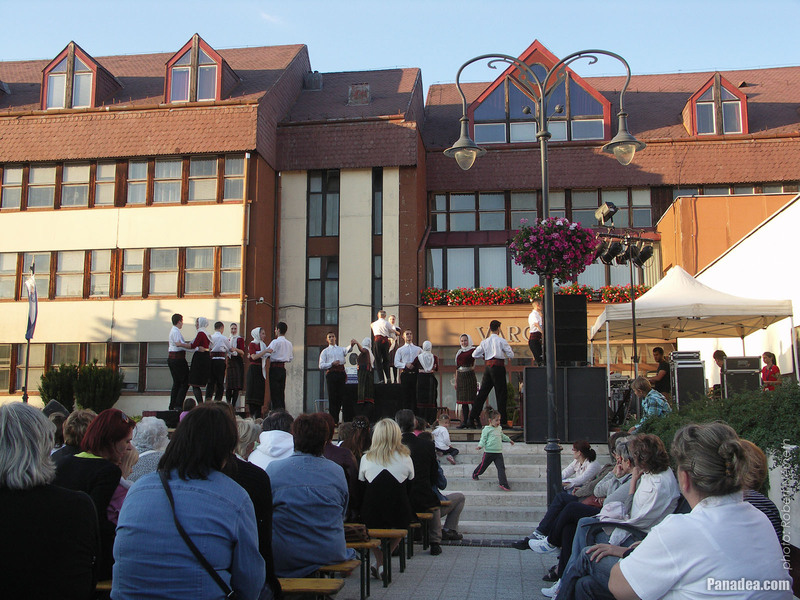 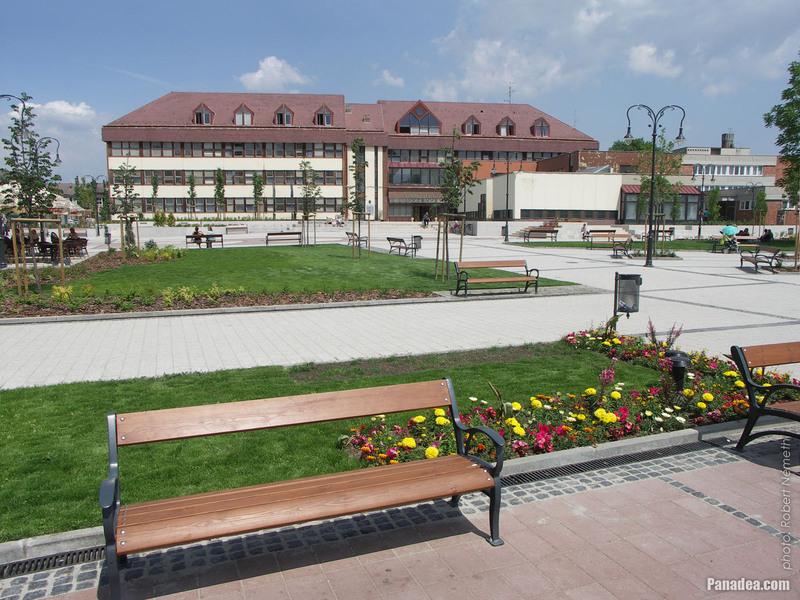 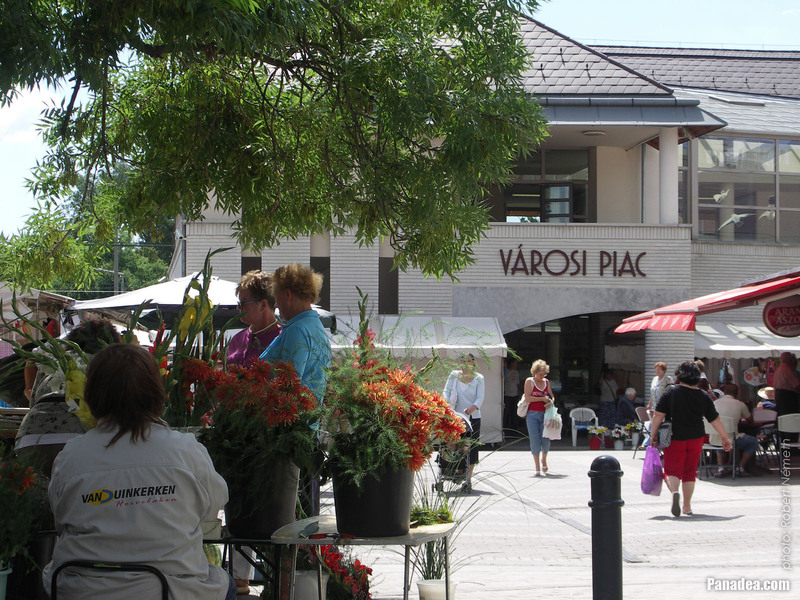 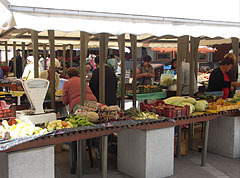 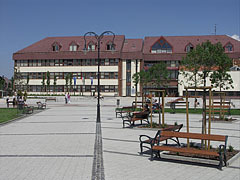 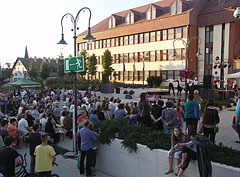 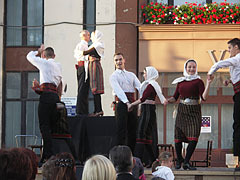 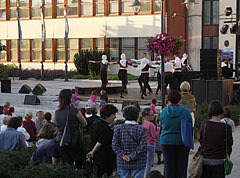 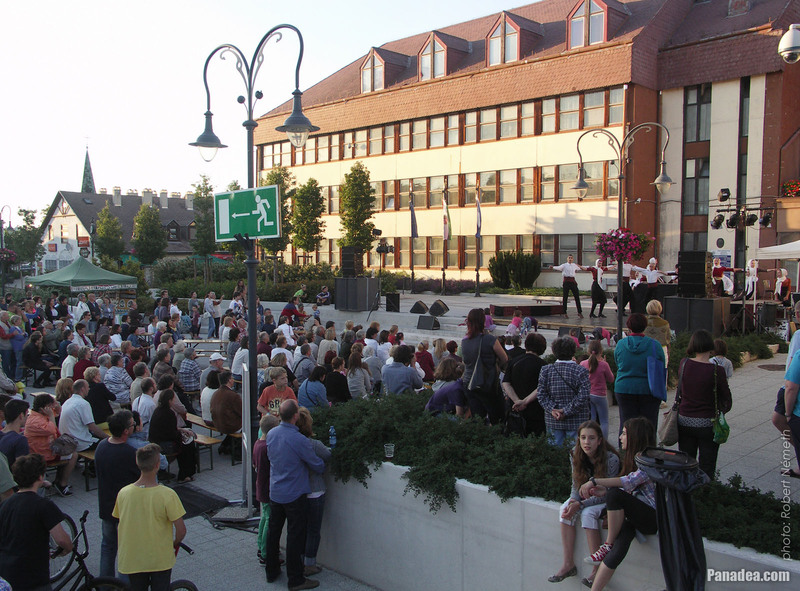 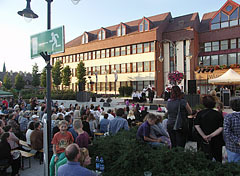 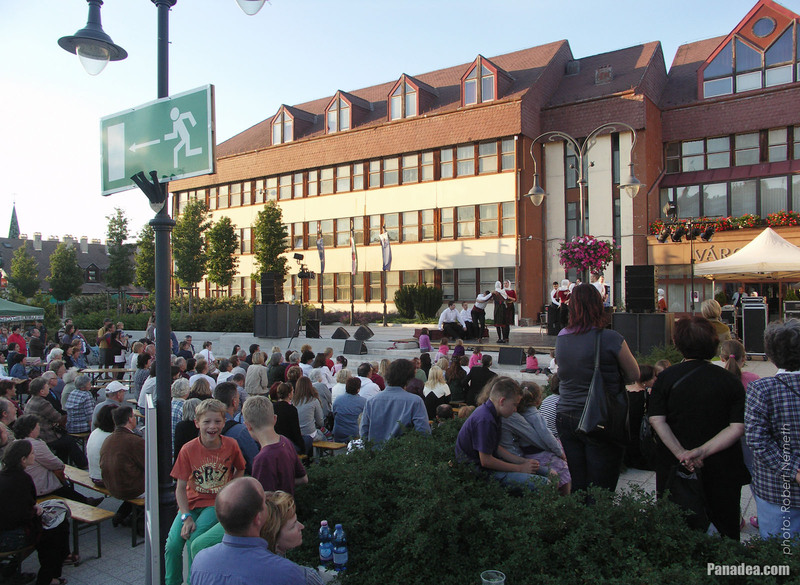 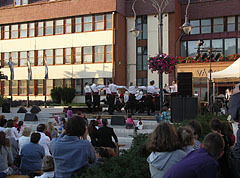 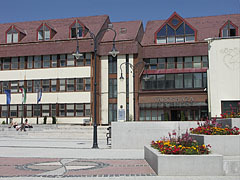 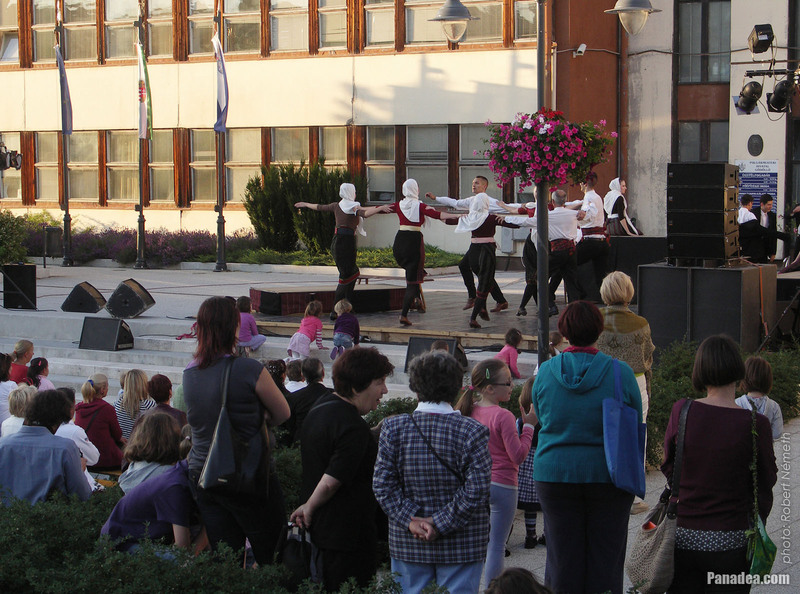 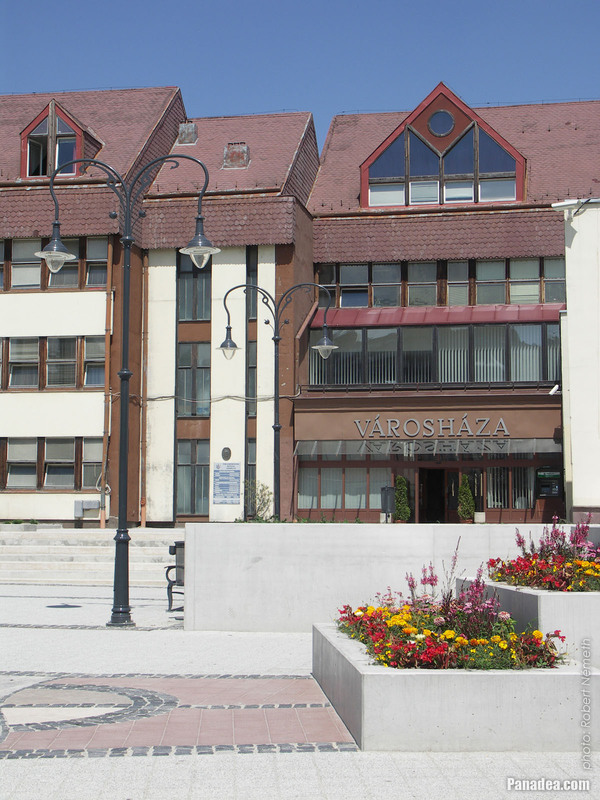 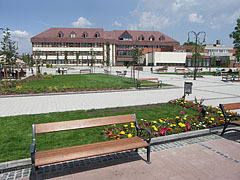 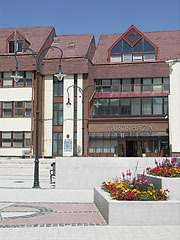 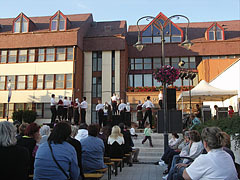 The square was completed in 2011. 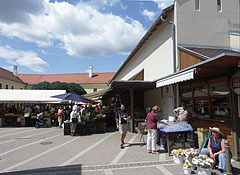 As it can be seen, before 2011 there was a car traffic and car parking area here. 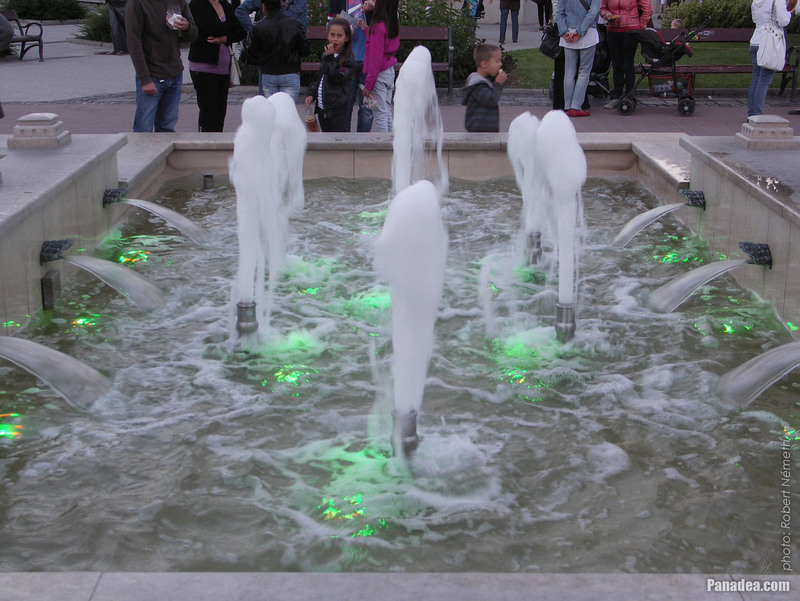 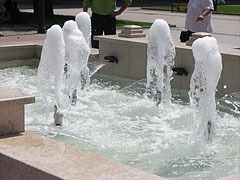 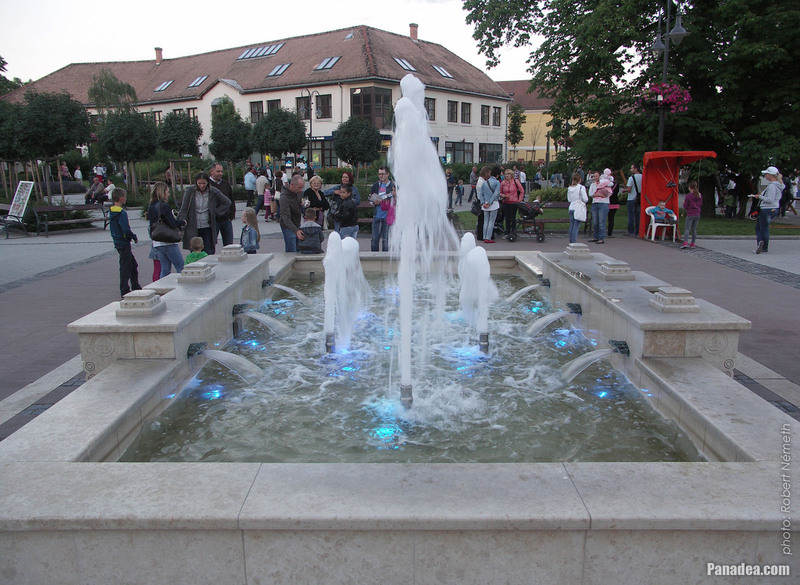 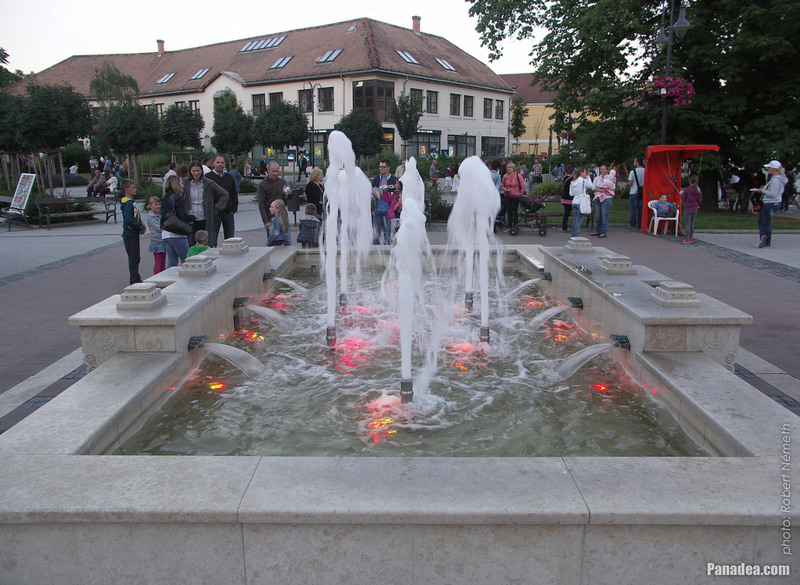 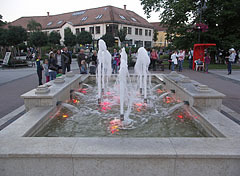 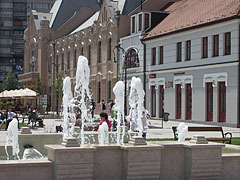 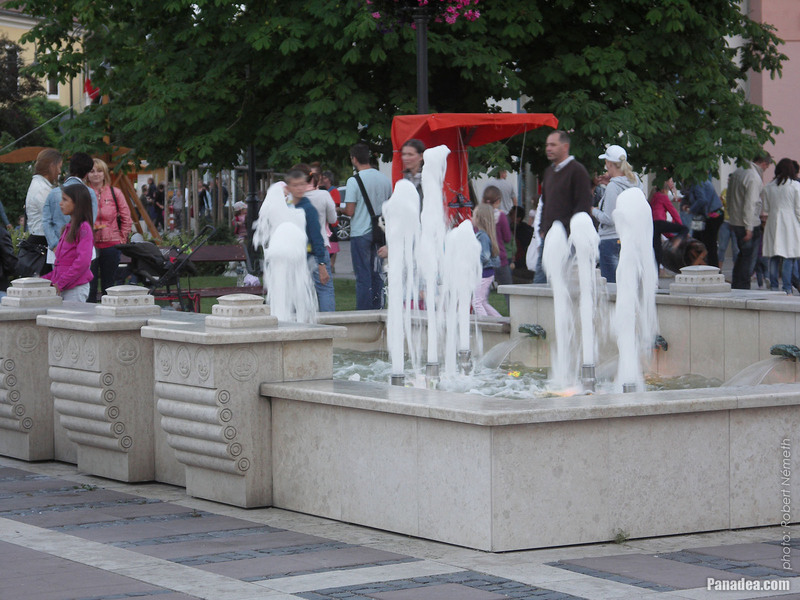 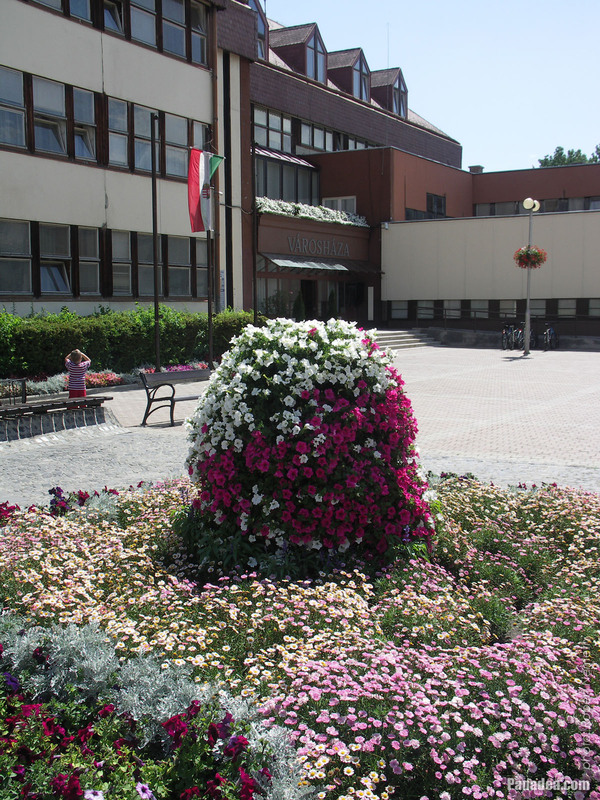 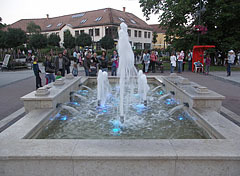 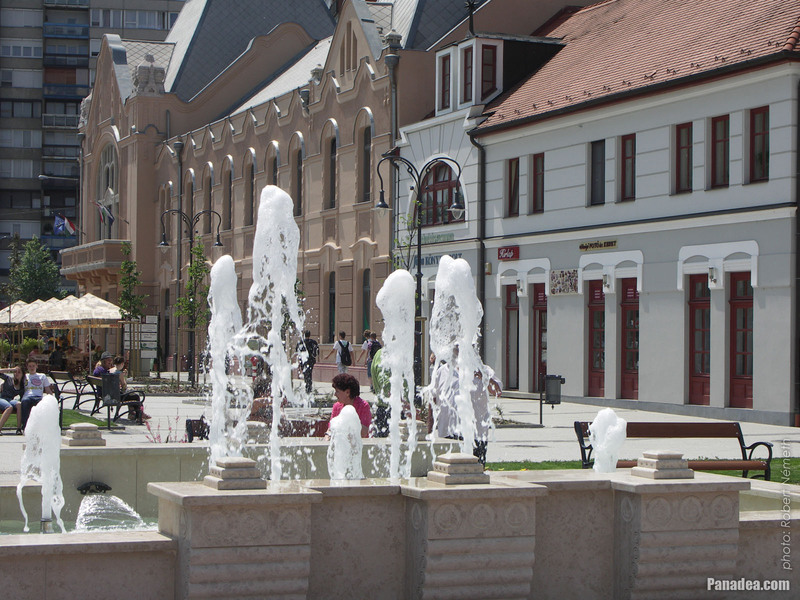 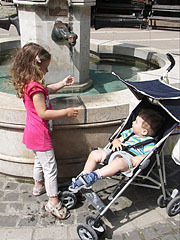 The fountain was designed by Jolán Mihály and built in 2010. 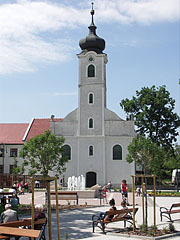 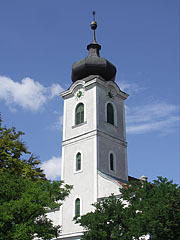 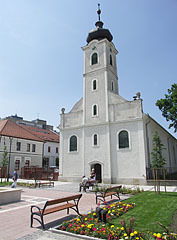 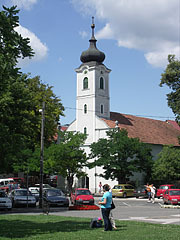 The first church of the Reformed Calvinists (Protestants) in Gödöllő was built in 1657, but due to the construction of the palace Count Antal Grassalkovich demolished it in 1744. 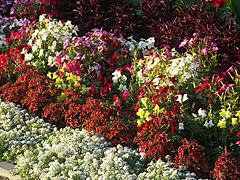 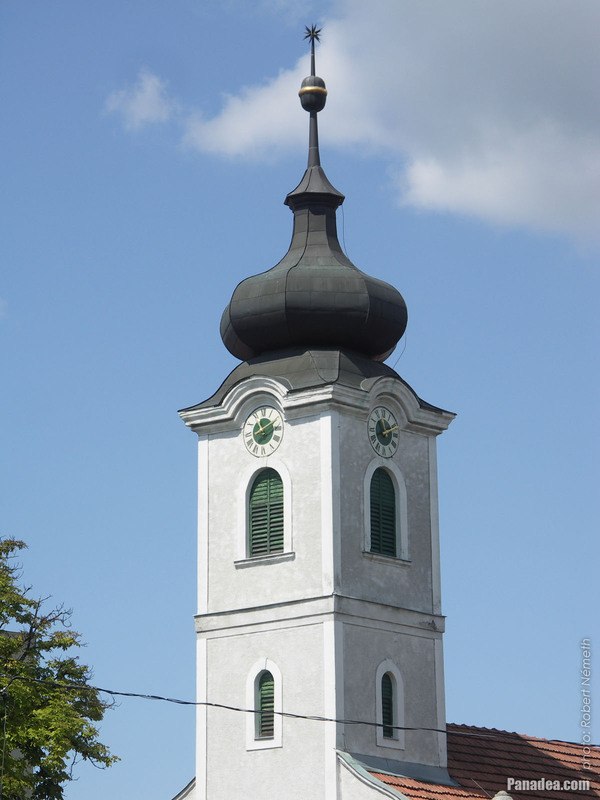 In exchange for it he compensated the Calvinist believers by money, plot and building materials. 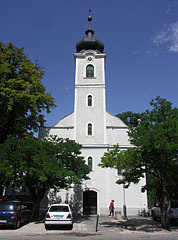 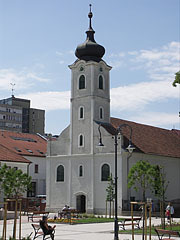 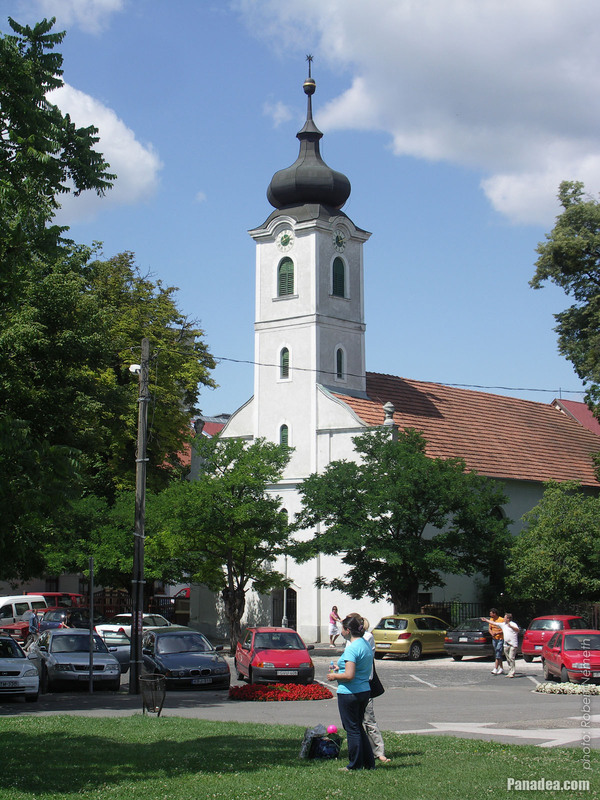 The baroque style church that can be seen today was consecrated in 1745. 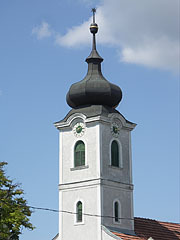 In 1801 its onion-dome tower was raised by 3 meters. 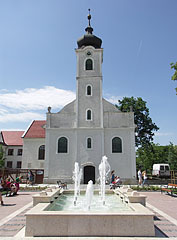 The baroque Hamvay Mansion is the oldest building of Gödöllő, Ferenc Hamvay had built it in 1662. 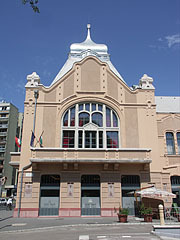 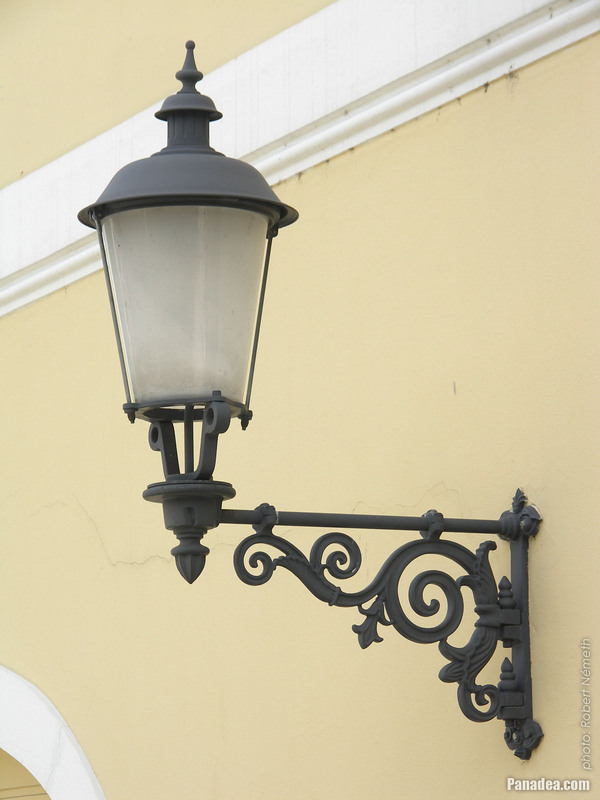 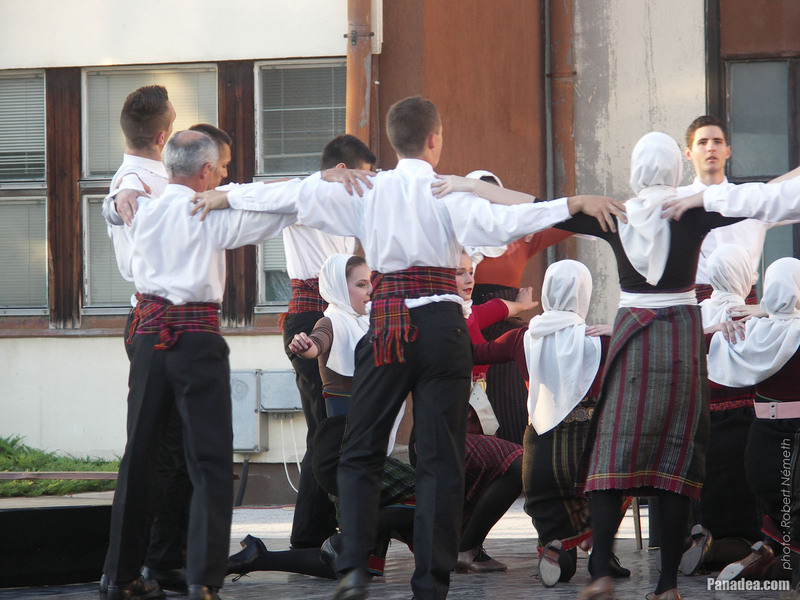 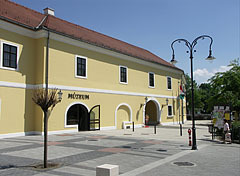 The present appearance of the building was created in the 1760s, in the era of Antal Grassalkovich. 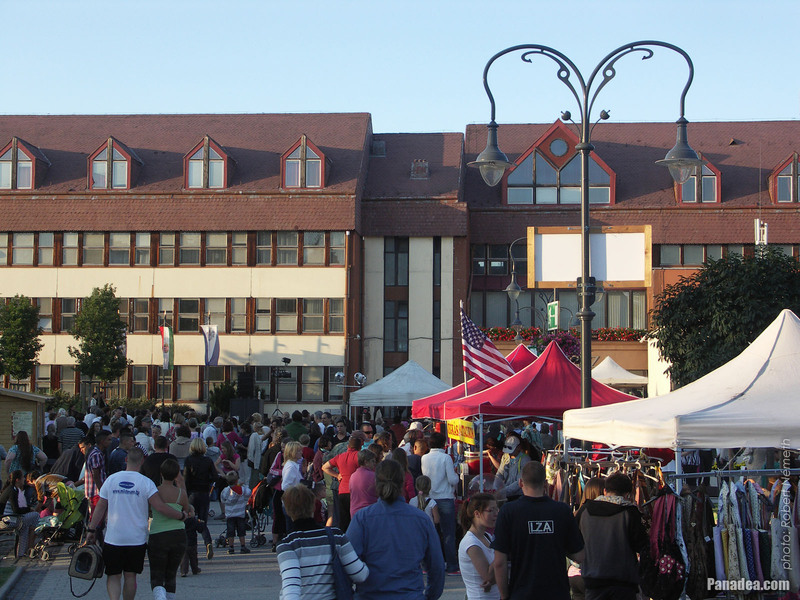 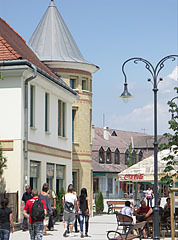 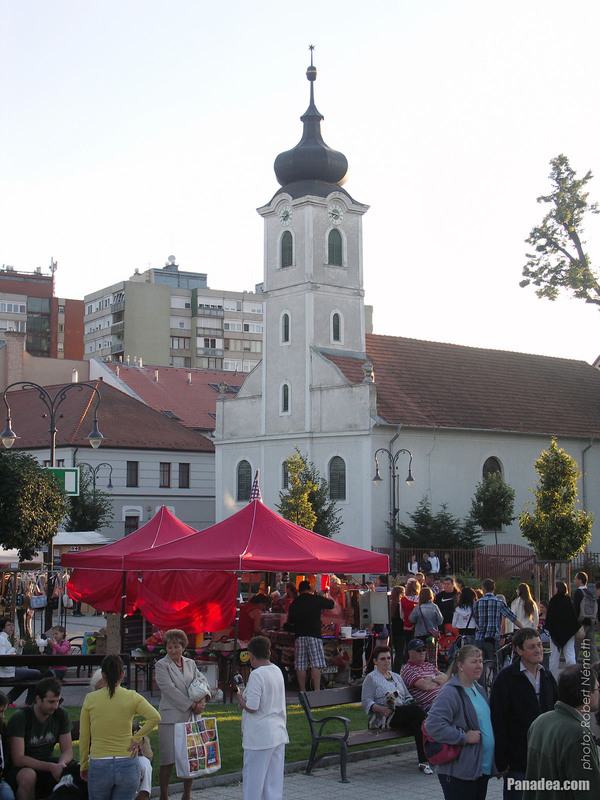 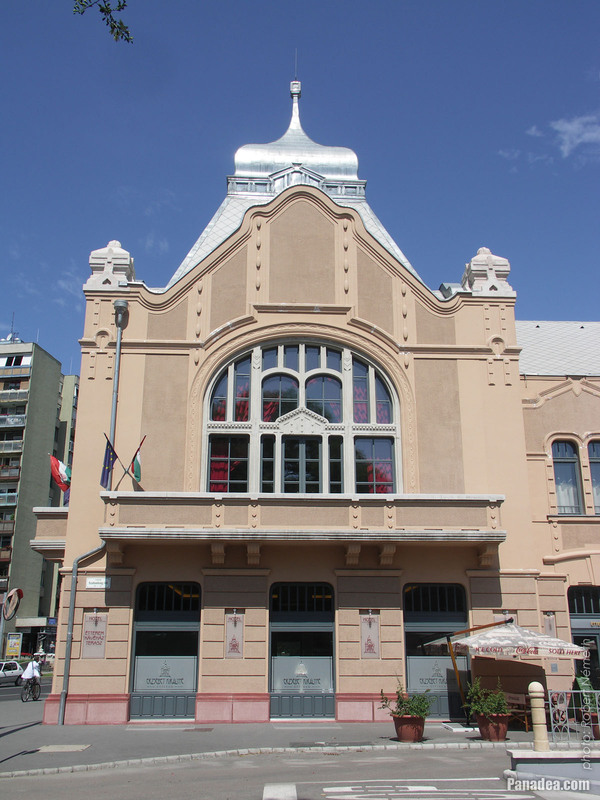 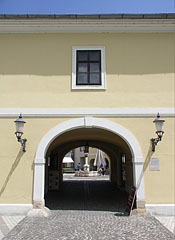 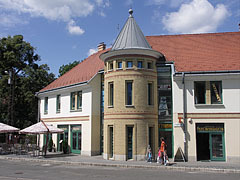 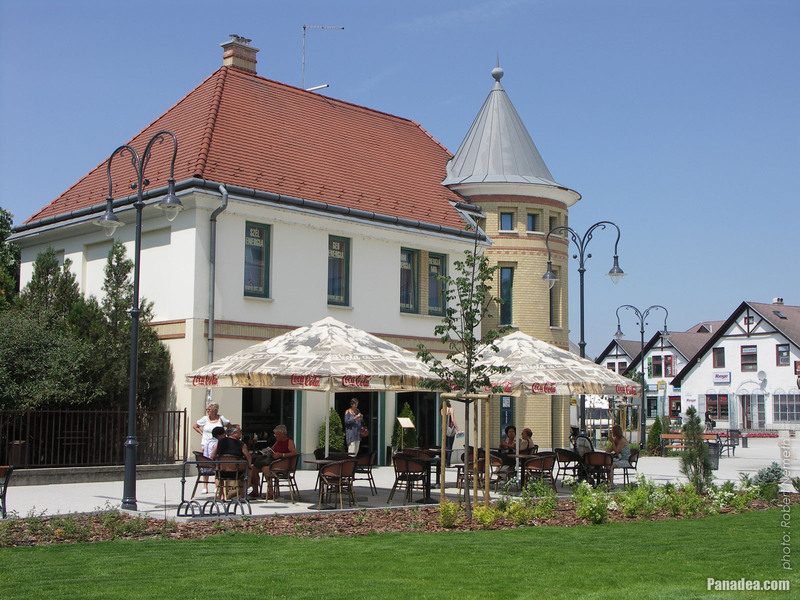 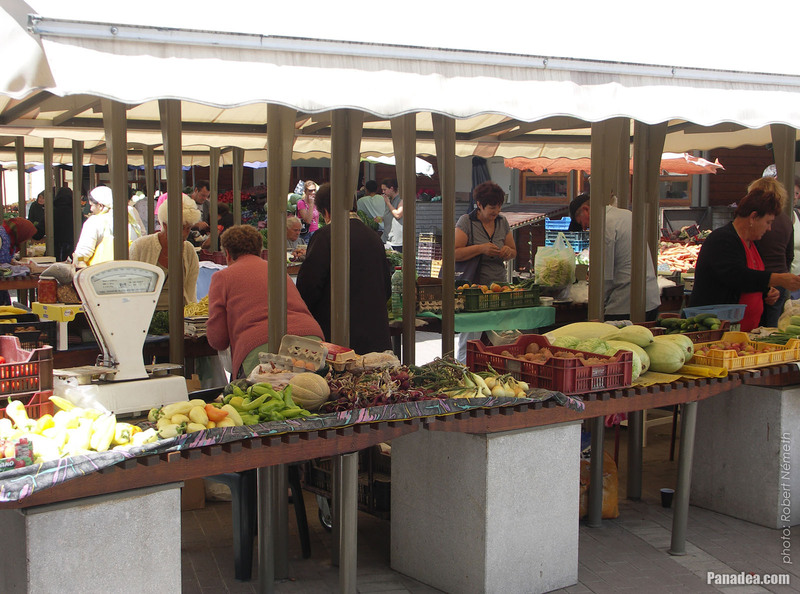 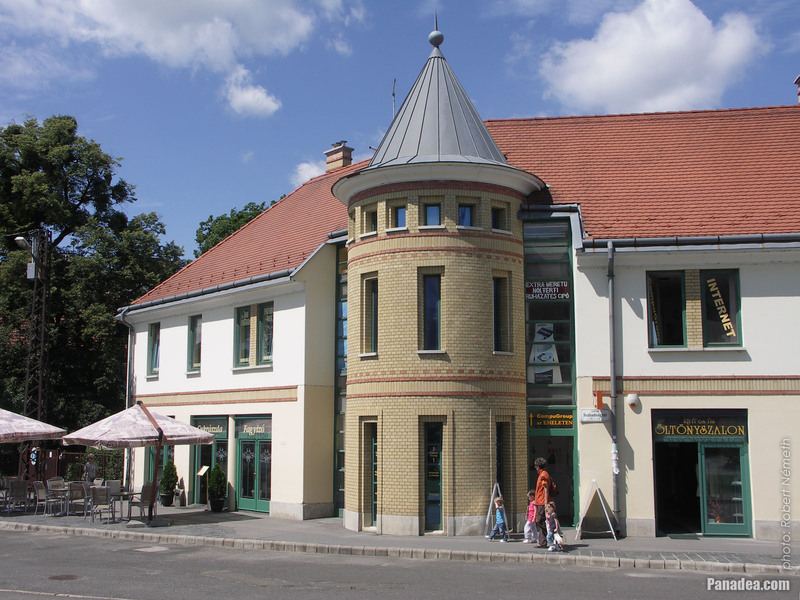 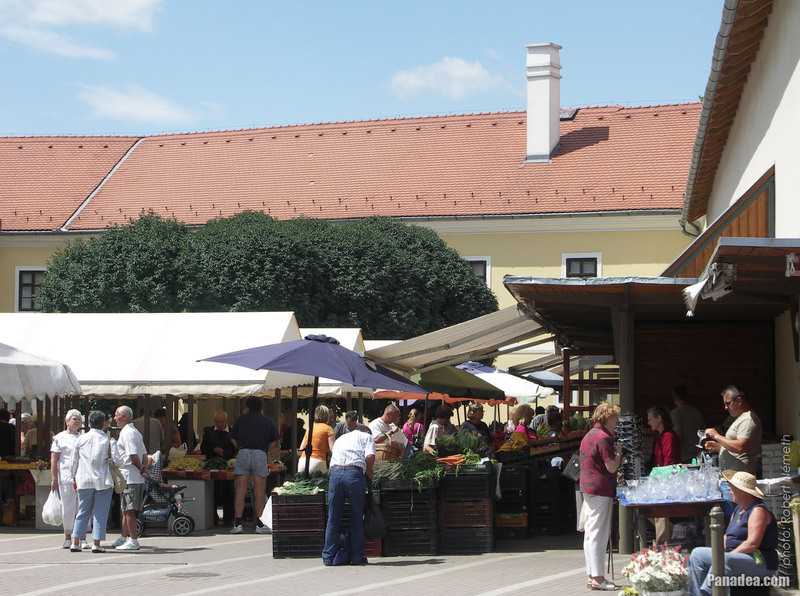 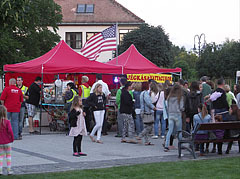 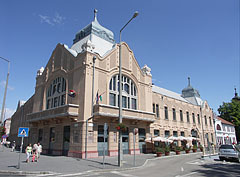 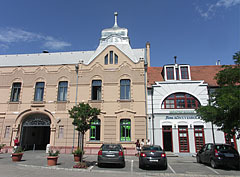 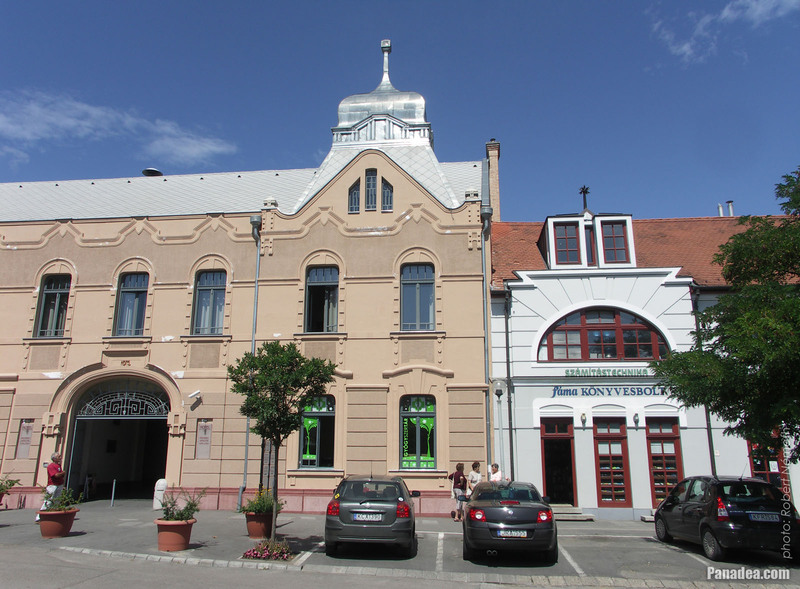 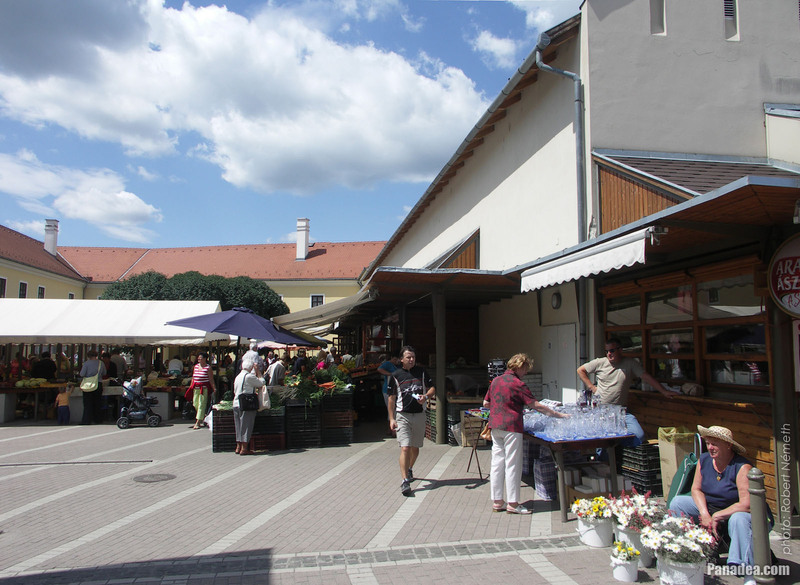 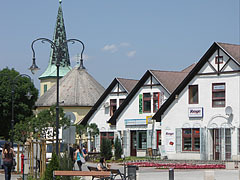 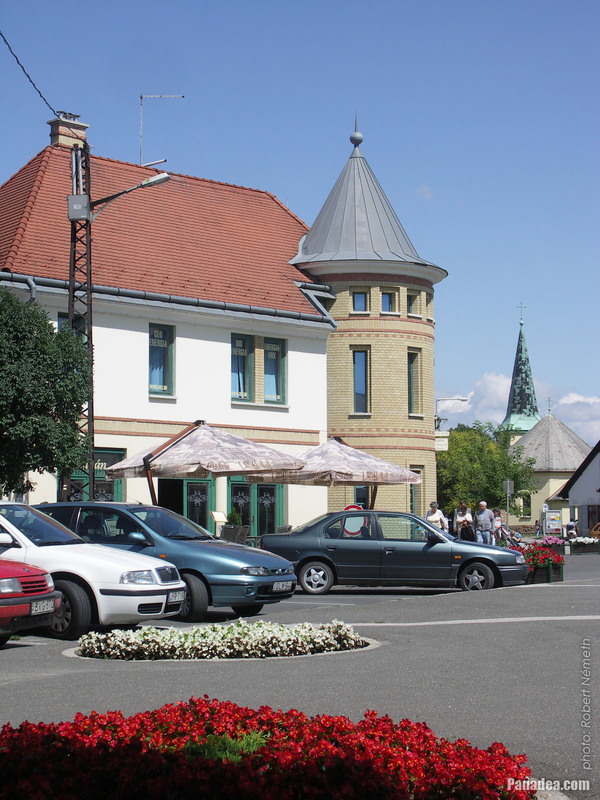 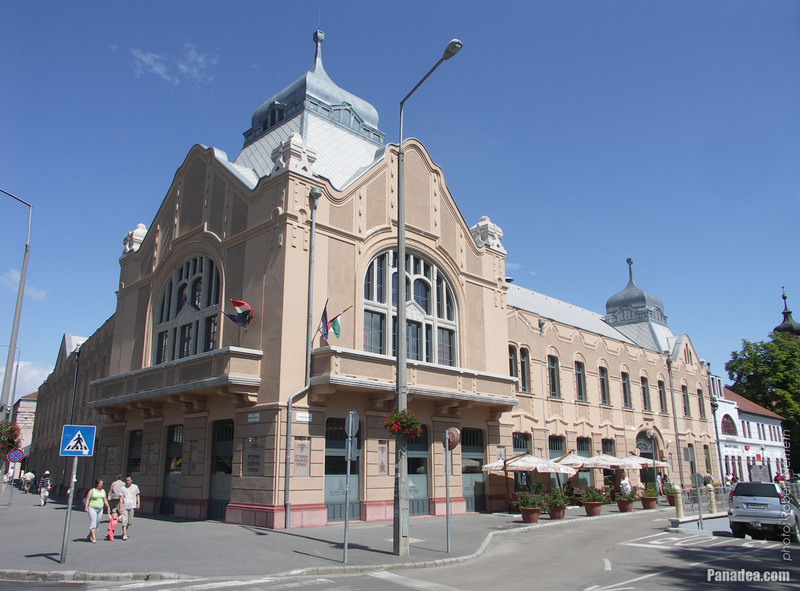 Later it was used as inn and school, today there is the Gödöllő Town Museum (local history museum) and a cinema within its walls, as well as the Town Market in its courtyard. 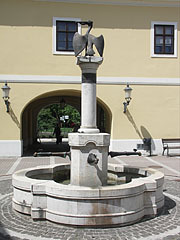 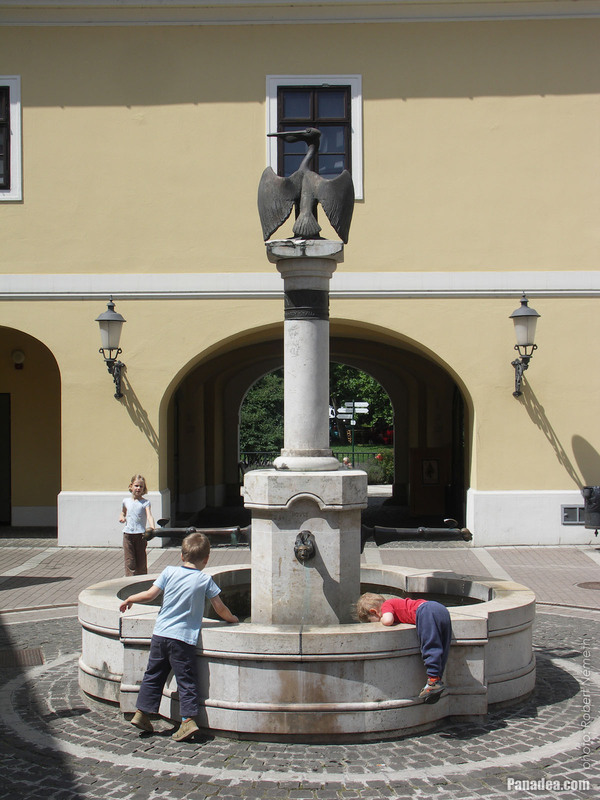 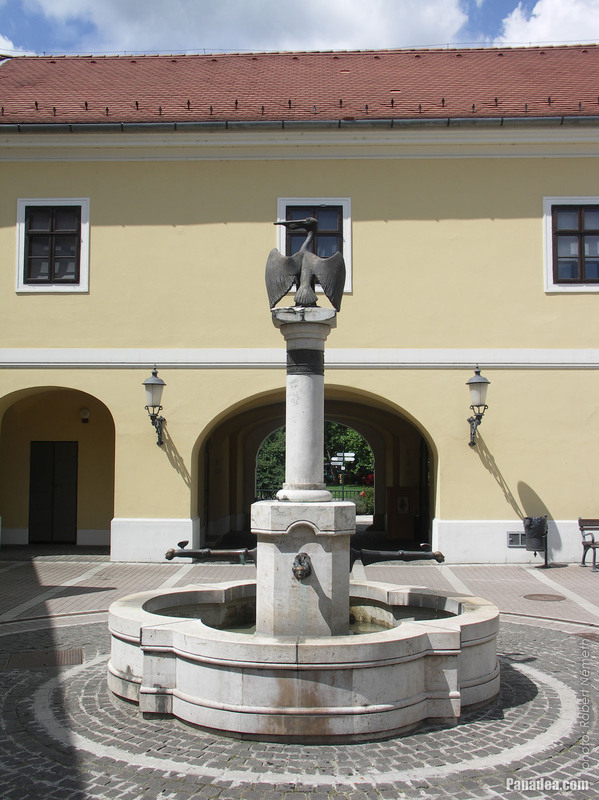 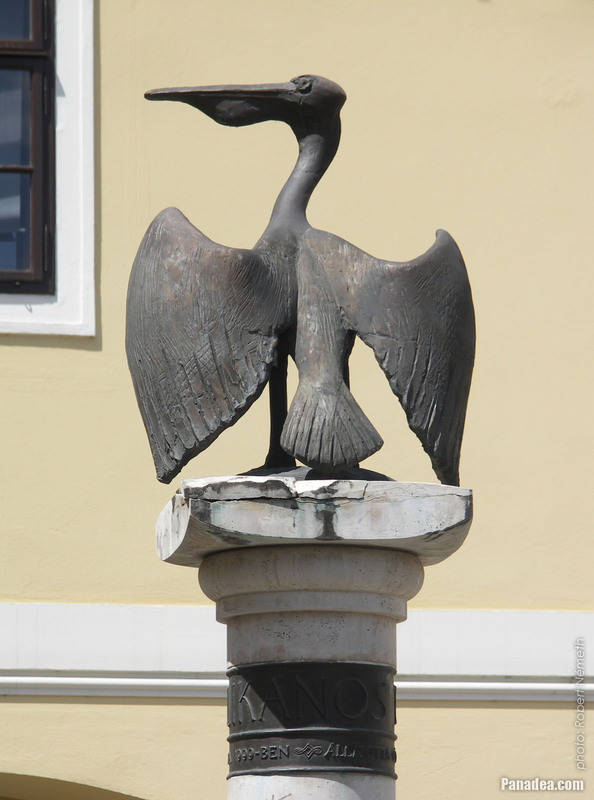 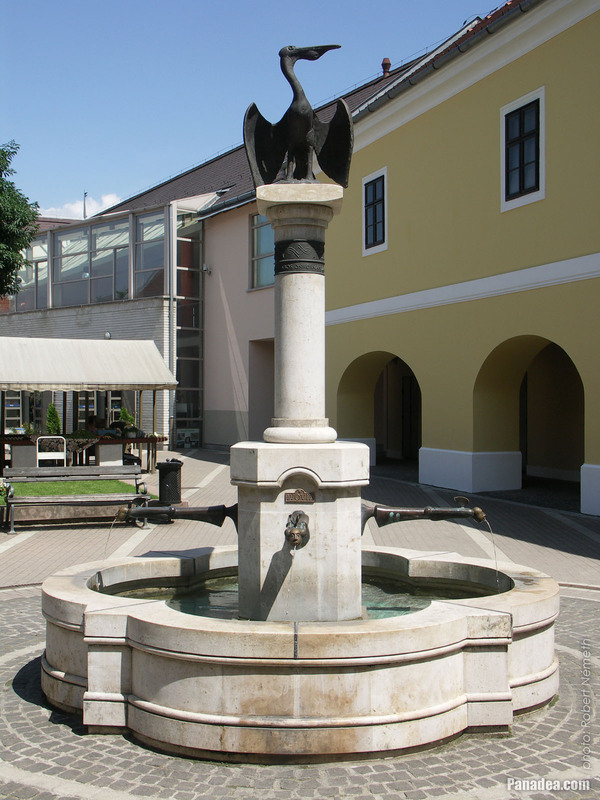 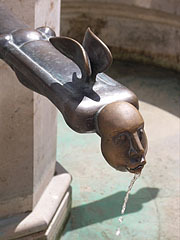 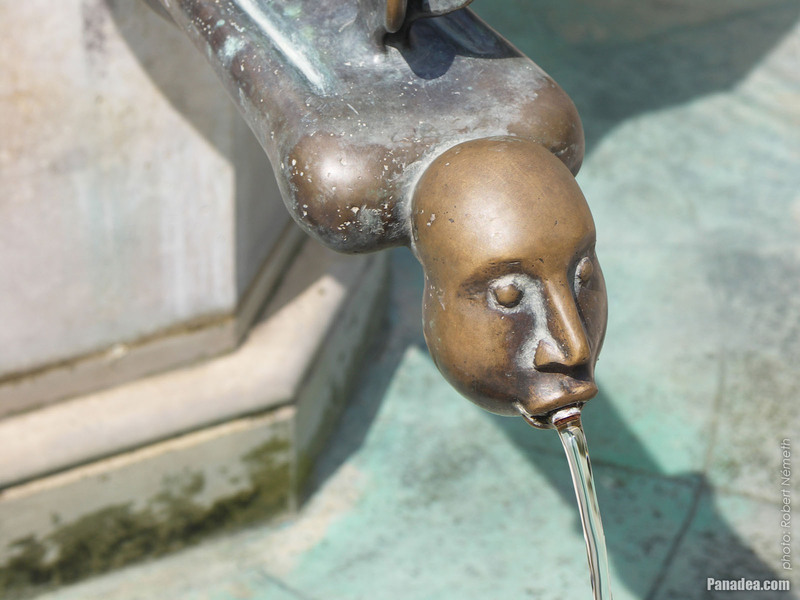 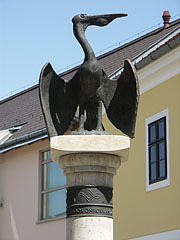 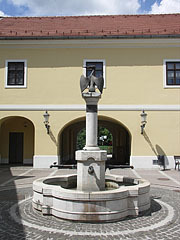 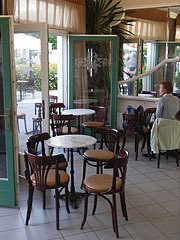 The Pelican Fountain is created by Tamás Asszonyi, it was set in the courtyard of the former Hamvay Mansion in 1999. 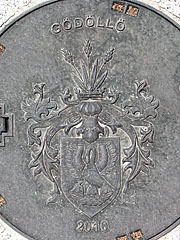 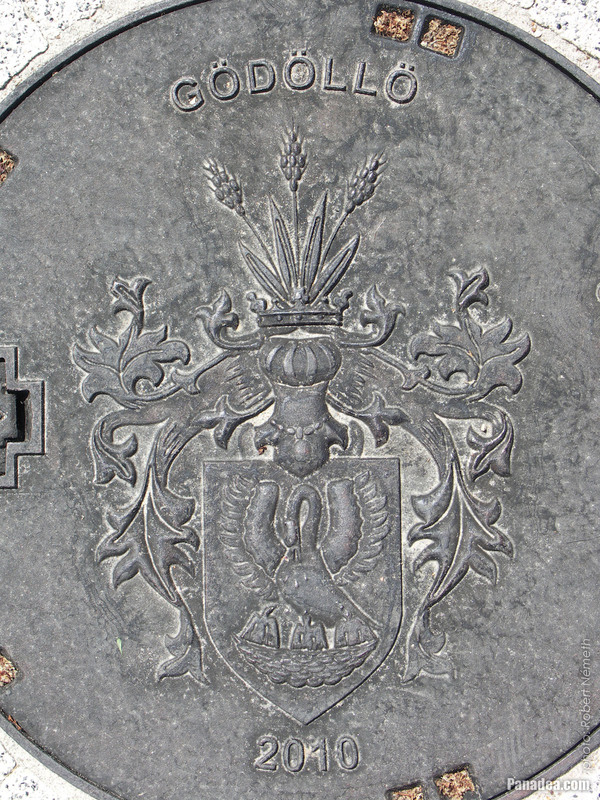 Among other things it represents a pelican, which is the heraldic animal of Gödöllő and also the eponym of the fountain. 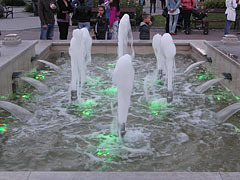 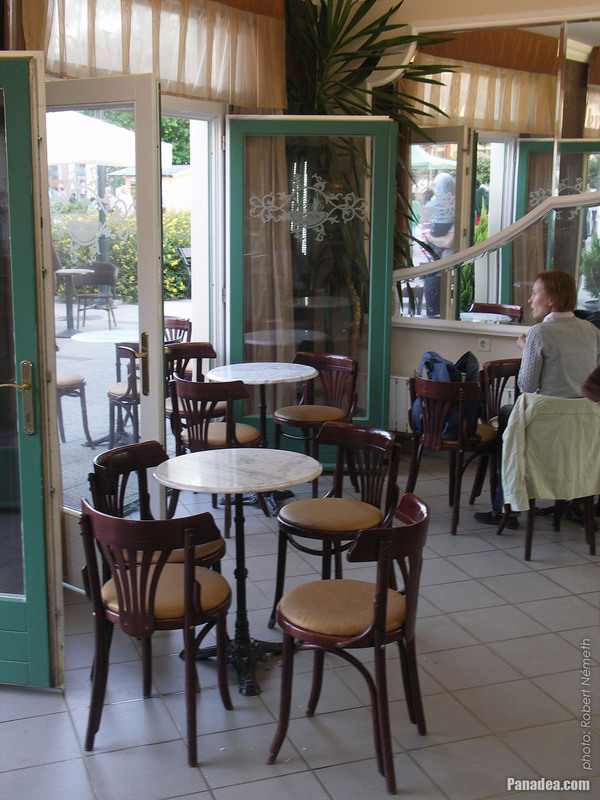 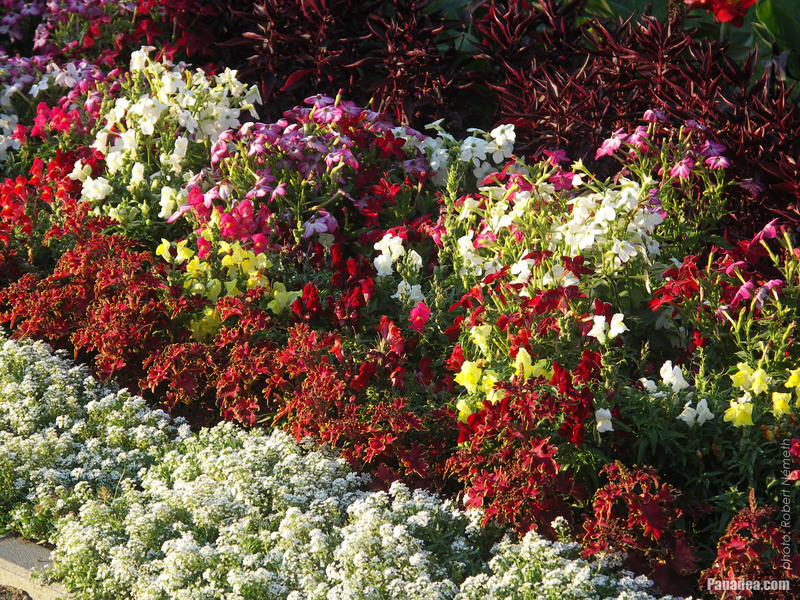 Its water is safe to drink and pleasant-cool, which is absolutely not negligible in summer. 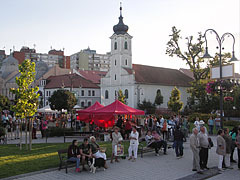 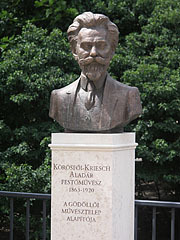 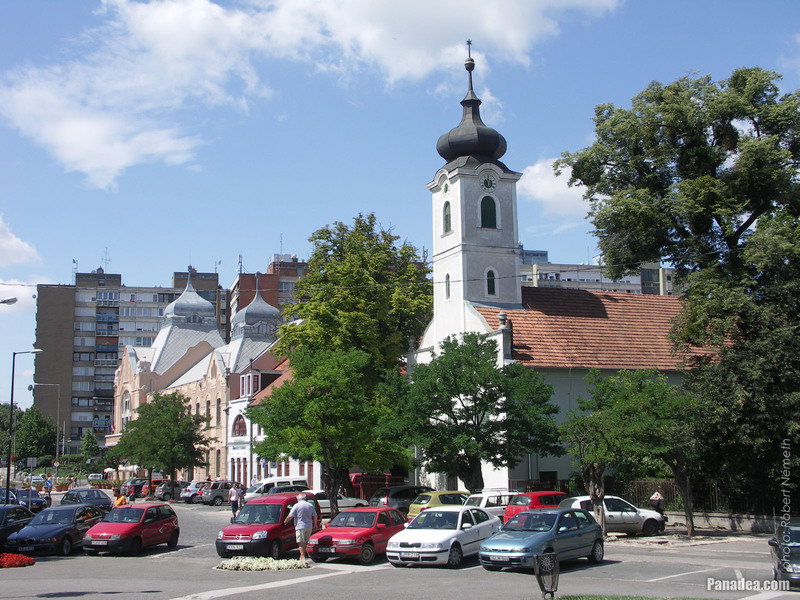 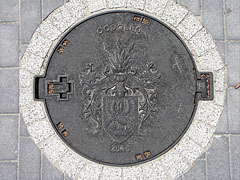 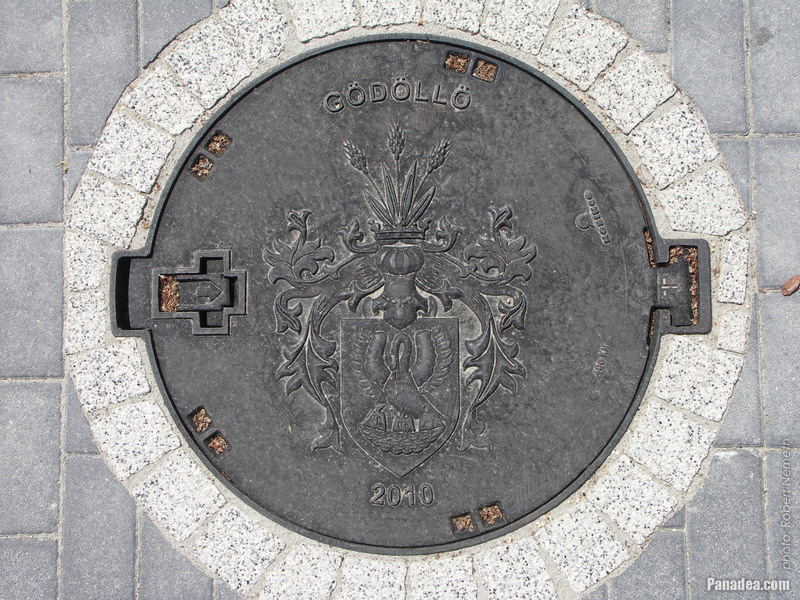 The first written record of Gödöllő town can be found in a deed of gift of King Louis I of Hungary ("Louis the Great") from 1349. 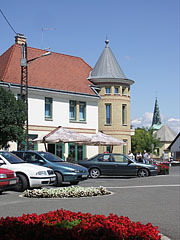 The name of the town received its present form officially in 1868. 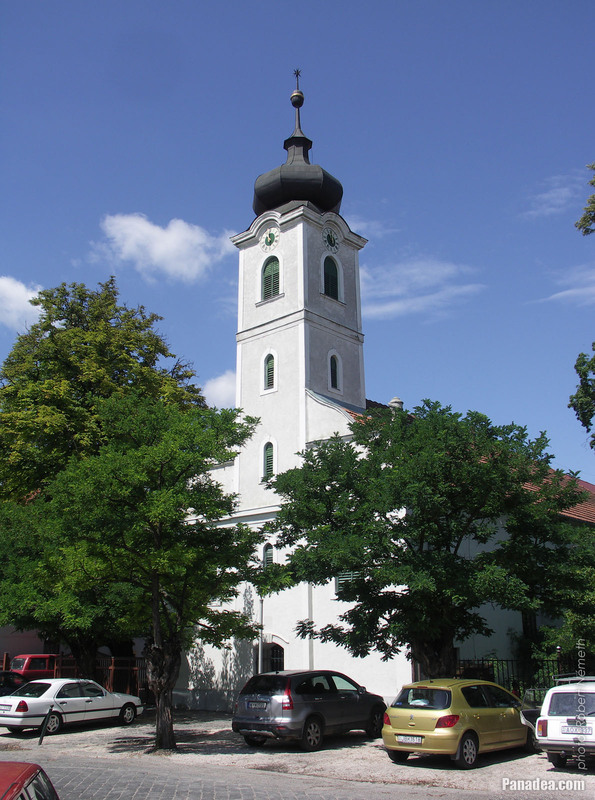 Gödöllő was completely destroyed and abandoned during the Ottoman (Turkish) rule. 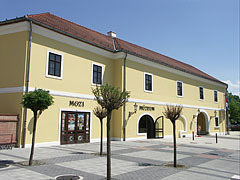 Later the people came back and the local squire Ferenc Hamvay was the first, who had built up his manor house in the town center. The so-called World Peace gong is a bronze artwork, it is 150 kilograms in weight and 2 meters in diameter. 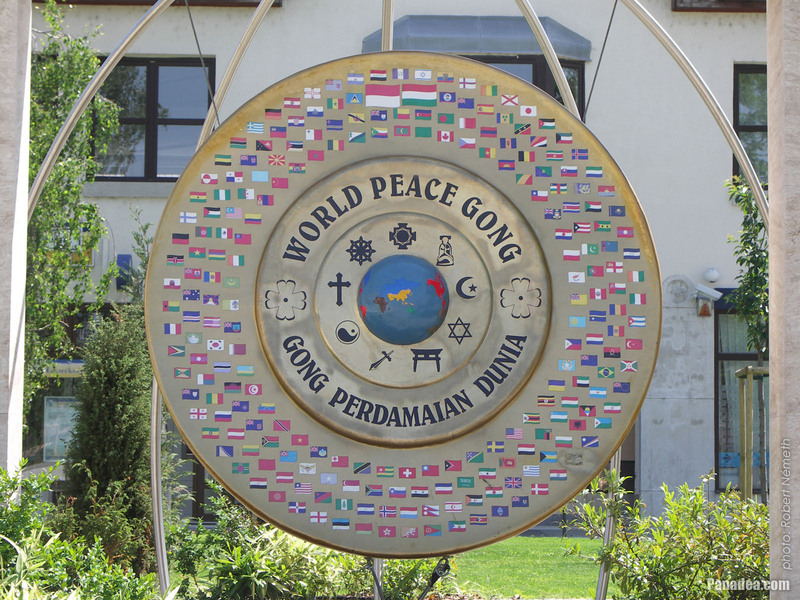 It represents the flags of the nations of the world, the symbols of the major religions and the map of the oceans of the Earth. 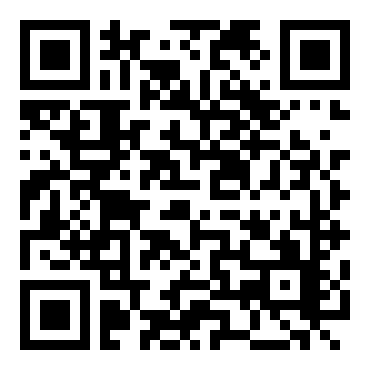 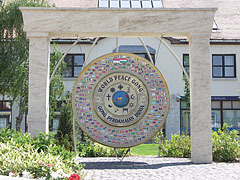 Its aim is to proclaim the brotherhood of the people in the world and that they belong together. 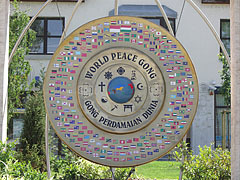 It also commemorates the 200 victims of the bomb outrage of terrorists on Bali Island, Indonesia in 2002. 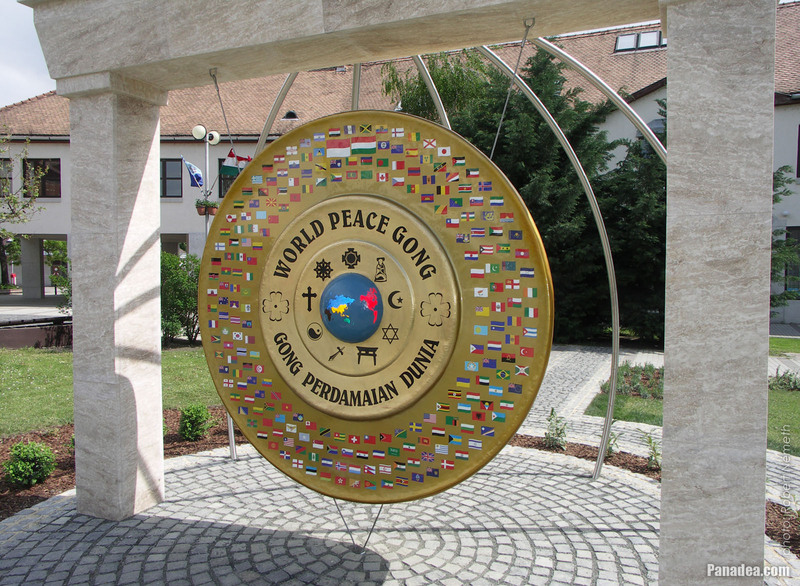 The World Peace Gong is made by the Indonesian sculptor Djuyoto Suntani, the World Peace Committee offered to place it here in 2007, in respect of the economic and social development of Hungary. 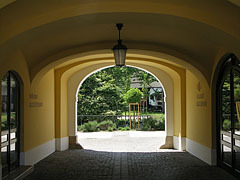 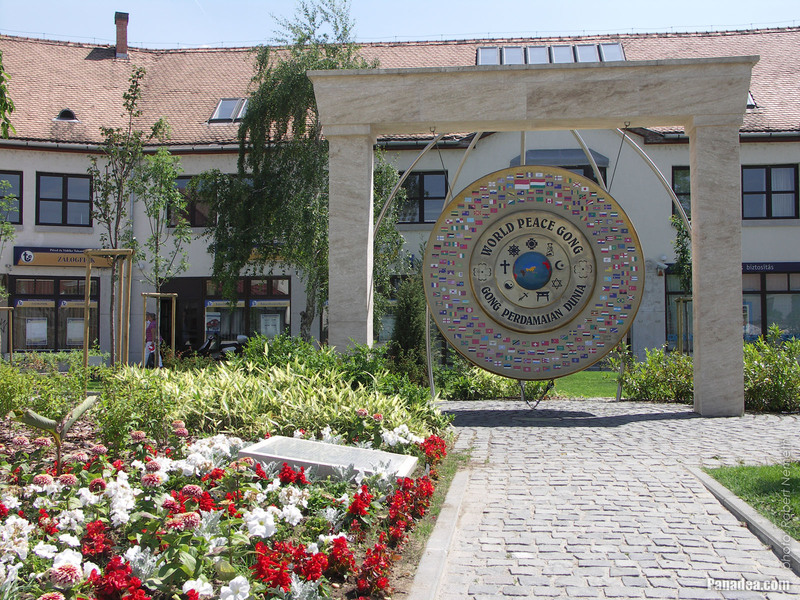 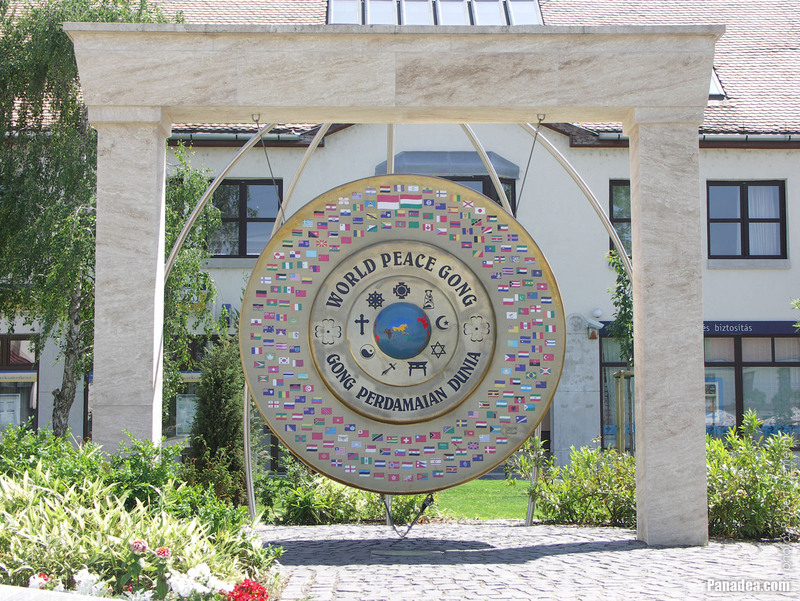 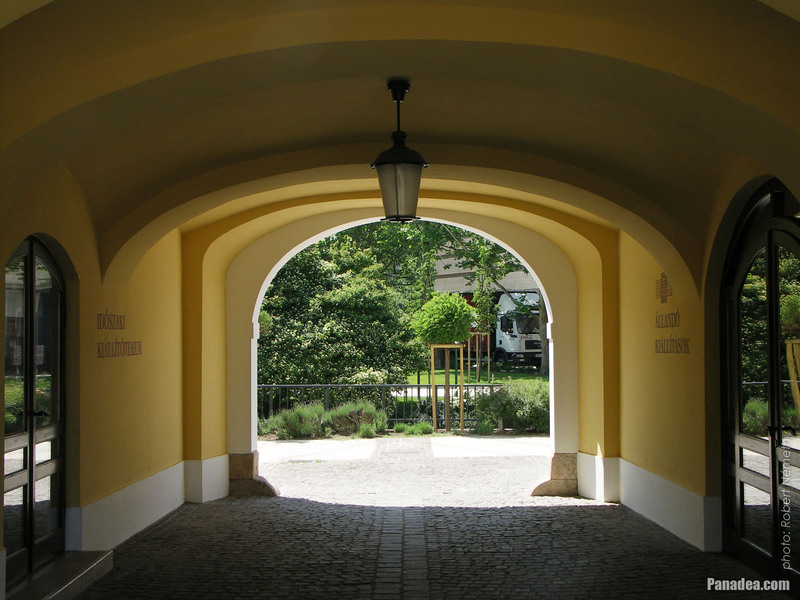 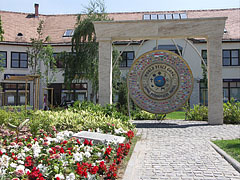 This one in Gödöllő was the first World Peace Gong in Europe and the fifth in the world.